See our UPCOMING EVENTS listings, below, for easy ways to make your Fall and Winter holidays fun and fabulous! It's not too late to build soil quality for next season! Make soil amendments. Adding nutrients to garden soils now will give your perennials a big boost next season. Divide and Transplant. 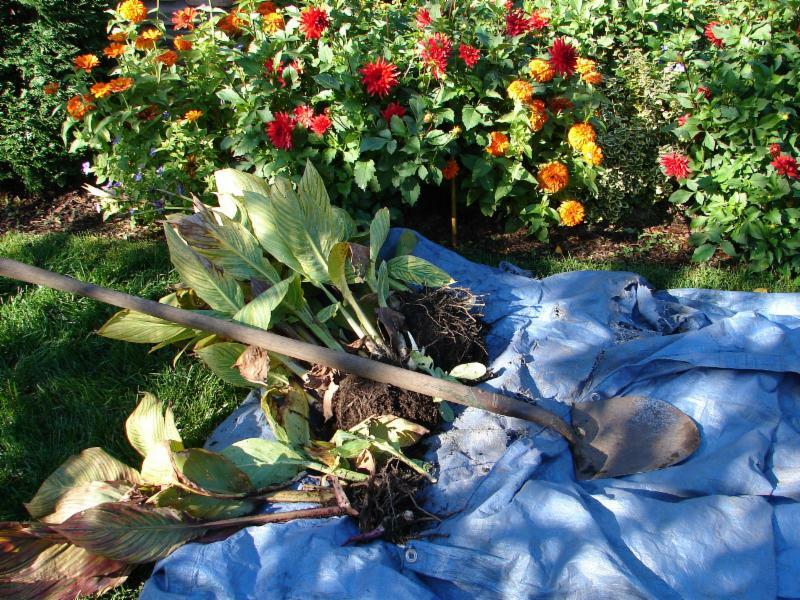 Many perennials can be split and transplanted. Cut back some perennials, but not all. Resist the urge to cut everything back and remove all debris. Leaving some debris to decompose naturally will help to nurture the soil. Leaving foliage up from plants 18" - 24" tall will provide a great habitat for beneficial insects, and make for a more interesting winter landscape. Perennials with high crowns, those that are woody, and those from the evergreen family can be left up. Angelica, Lady's Mantle, Bergenia, Joe Pye Weed and Astilbe are good examples of perennials to leave up. See Heidi's list of plants to leave up, and what to bring in, here. Remove mold-prone plants. These include most annuals, Rose petals, Peony, Iris, Phlox and Monarda (Bee Balm). Bring in tropical tubers and houseplants. They can be stored indoors for re-planting next Spring. 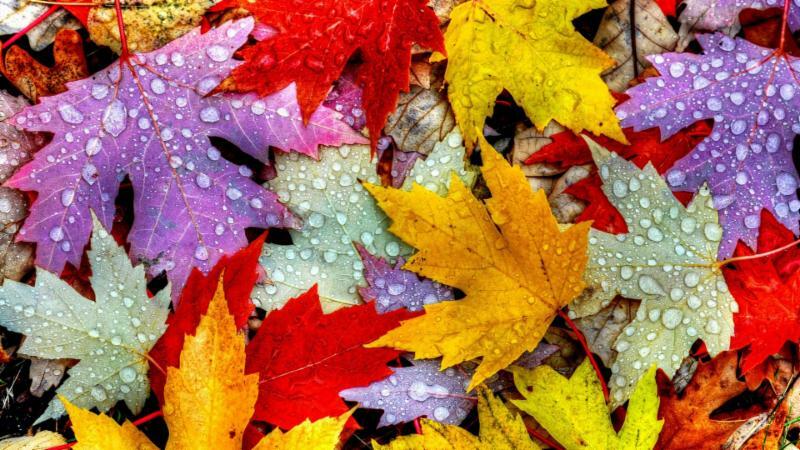 Plant shrubs and trees until November 1st. Plant Fall bulbs now for Spring blooms. It's Easy to Plant Fall Bulbs! Plant bulbs at a depth twice its height. Place bone meal or bulb food at the bottom of the hole. Plant the bulb pointy side up. If the pointy side isn't obvious, lay the bulb on its side, and it will find its way to the surface. Cover the planted hole with chicken wire, or sprinkle cayenne pepper on top of the soil to discourage hungry squirrels. 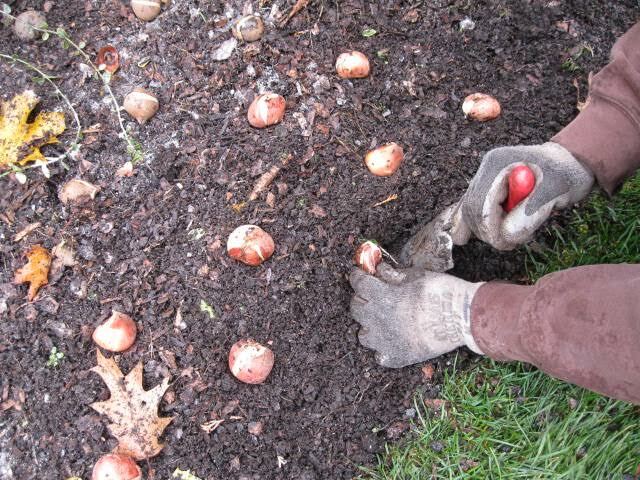 Plant 10 bulbs per hole for small groupings. For mass plantings with high impact, plant 50 bulbs of the same variety. 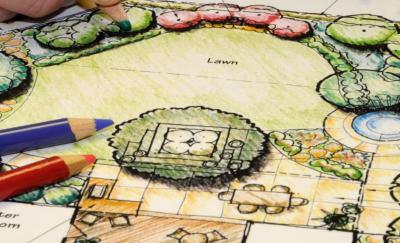 Choose high visibility, sunny areas with well drained soil. Areas along an entryway or an area viewed from a window are great places to enjoy the blooms! Our "grab and go" ready made Fall Harvest containers and large selection of pumpkins, gourds and Fall accents will brighten up your entryway or patio immediately! 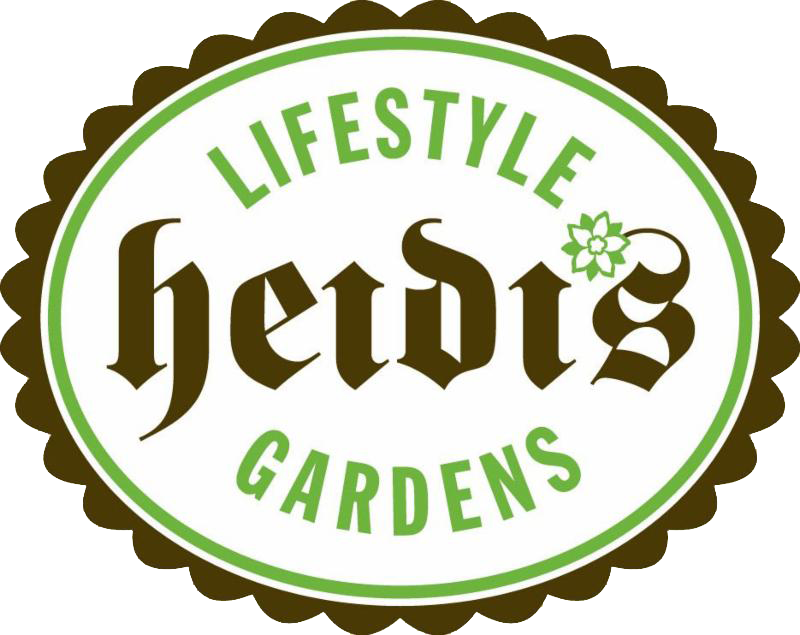 Check out our selection at GrowHaus now! Now through Oct. 28: 25% off all Fall decor! 50% off! All perennials and all pottery! Our fine gardening division crews are in the midst of putting gardens to bed, removing buckthorn, and installing Fall bulbs. Holiday spruce tip installations will begin November 1st. Holiday light installations can be ordered now. We even install Halloween lighting! Our party staging team is scheduling holiday events now. Their expertise in holiday lighting, greens, arrangements, garland, custom wreaths and trees will make any gathering truly special! Call us for more information: 763-420-2909. 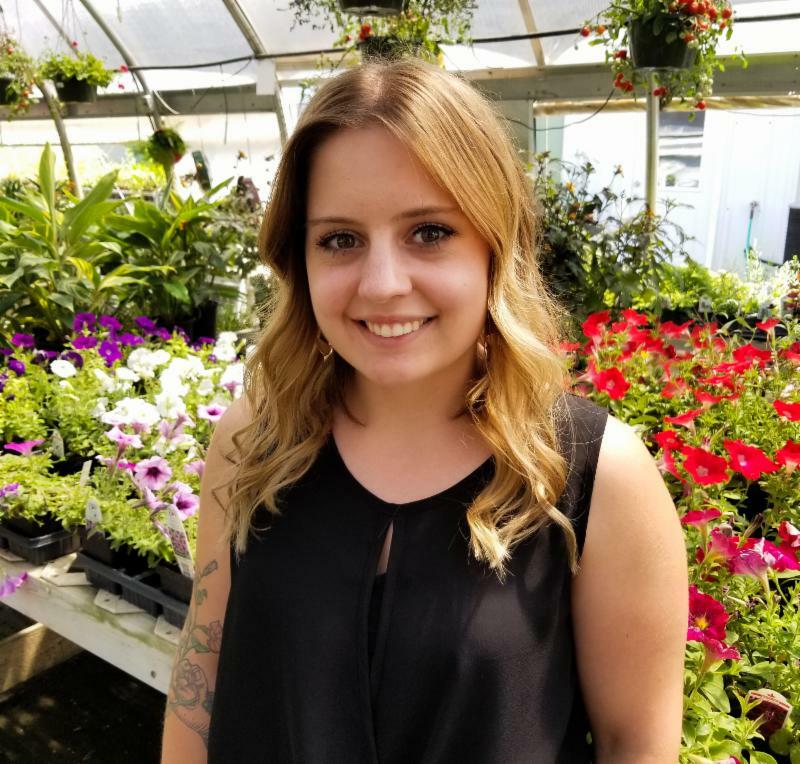 Meet MacKenzie Cochran-Domben, one of our Landscape Designers, and an experienced horticulturalist who joined our team this Spring! She earned her Bachelor's degree in Horticulture from the U of MN Crookston. MacKenzie grew up on a hobby farm which produced its own food and cultivated many perennial and annual flower beds. Her love of gardening is in her DNA. We're lucky to have her on board! and Distinctive Wreaths that Last through the Season! 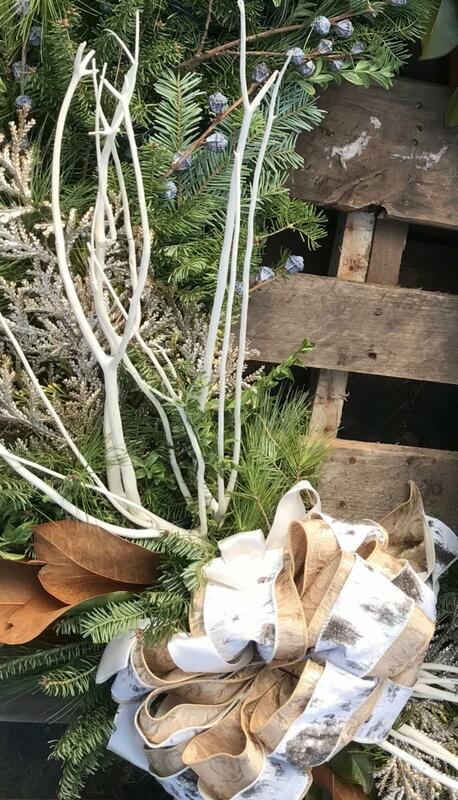 By popular demand, we've expanded our custom spruce tip container and wreath production area for our "grab and go" ready-made containers and wreaths! 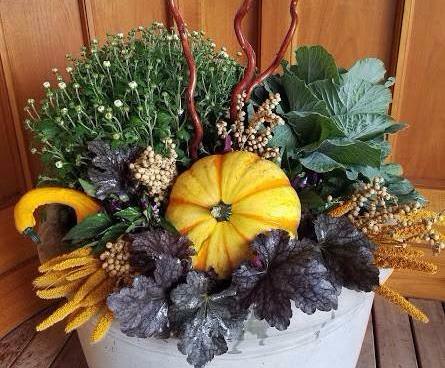 We design one-of-a-kind, ready-to-go containers and wreaths with our super fresh greens and fabulous assortment of accents. We're setting up our "Winter Wonderland" area for a November 1st opening, with an extensive assortment of unique materials if you prefer to make your own creations. 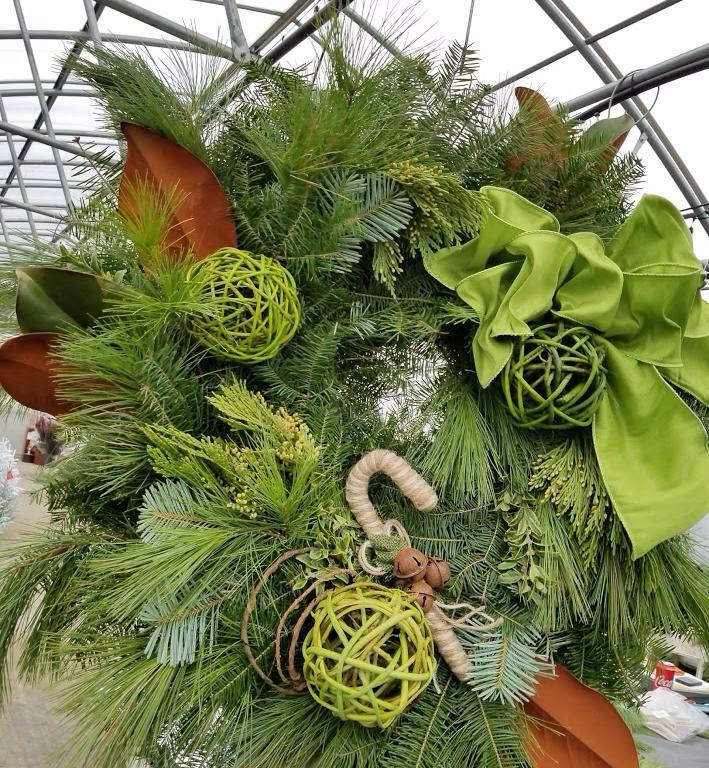 Come visit to learn how to embellish your wreaths to compliment your spruce tip containers! 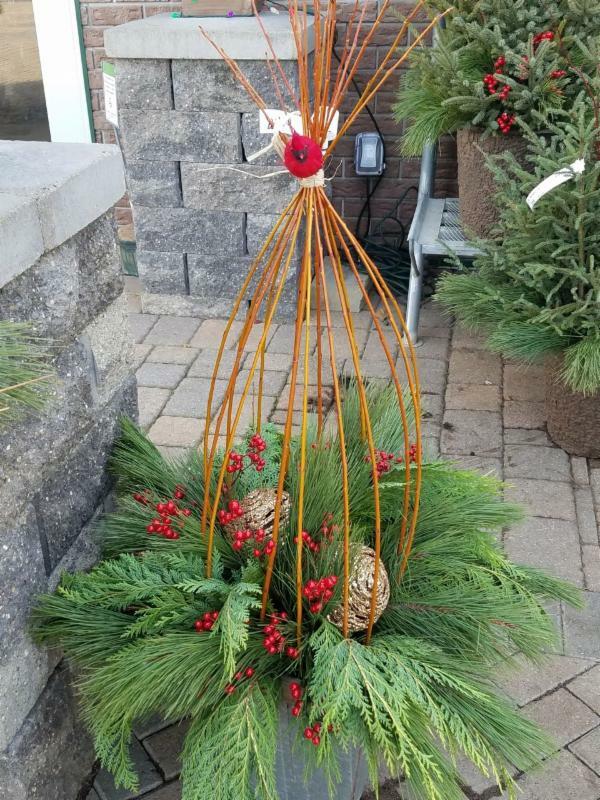 See how spruce tip containers with Fall and Thanksgiving accents can be switched to Holiday accents, then switched out again to last through the Winter. 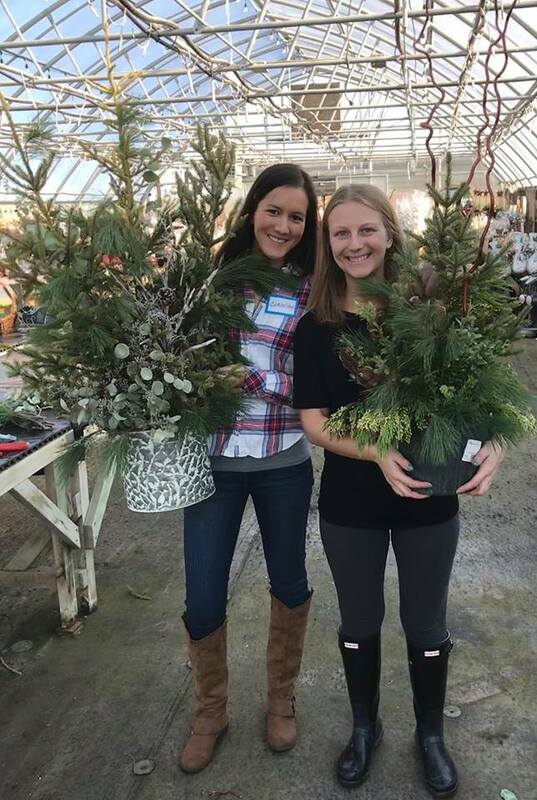 Or, sign up to attend one of our Wintergreen Workshops on November 3rd, 9th or 10th, where you can make your own spruce tip containers, wreaths, centerpieces, window boxes and more! Don't miss this super fun event! See more details in our Upcoming Events section, below. Custom spruce tip containers, wreaths, and fresh or flocked trees can be ordered in advance, too! Just call us at 763-475-2960, or write: info@GrowHausMN.com. Succulent Pumpkin Planters and Pumpkin Carving Event! October 27th: Anytime between 10:00 AM - 4:00 PM! 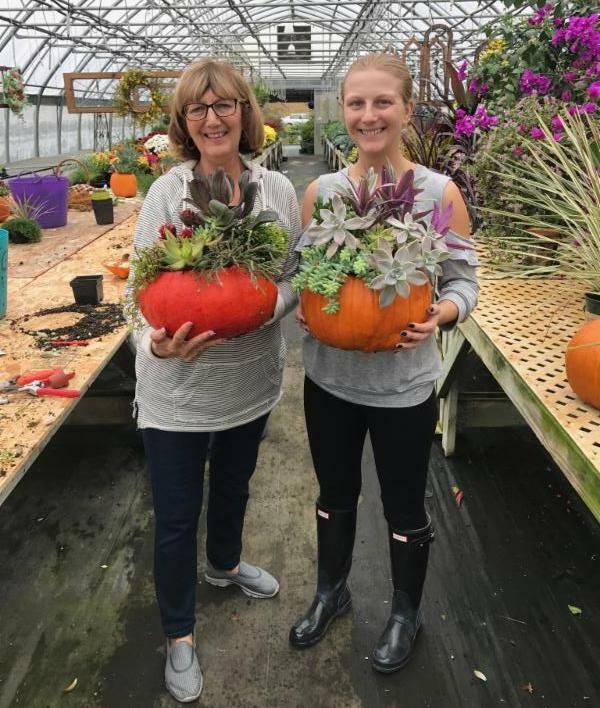 Join us on Saturday, October 27th to create your own succulent pumpkin planter from our unique selection of succulents and pumpkins! Cost of pumpkin and plant materials only. 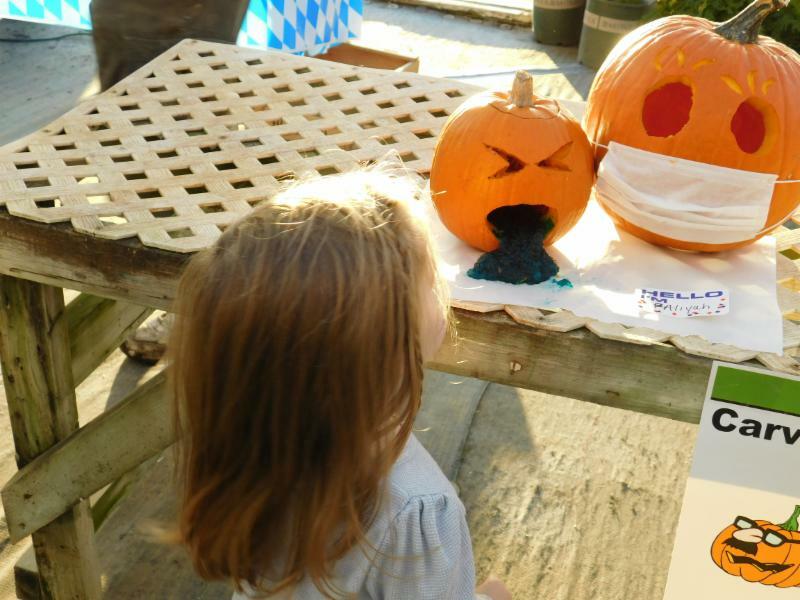 Or create your own jack-o'-lantern masterpiece! 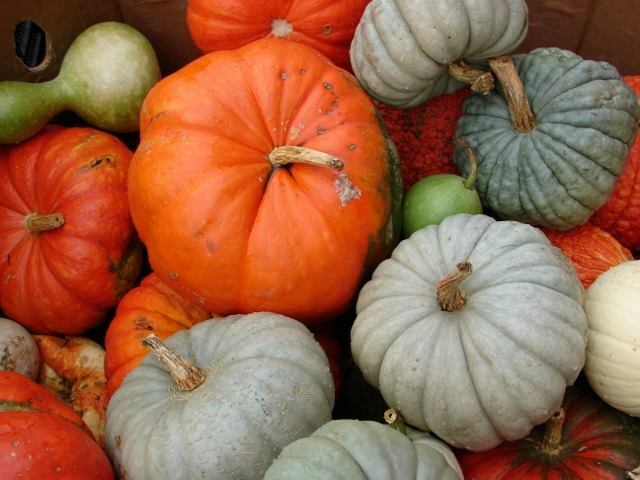 We'll have lots of interesting materials available for you to carve or paint the pumpkins of your choice! Cost of pumpkin only. Wintergreens Make and Take Workshops! 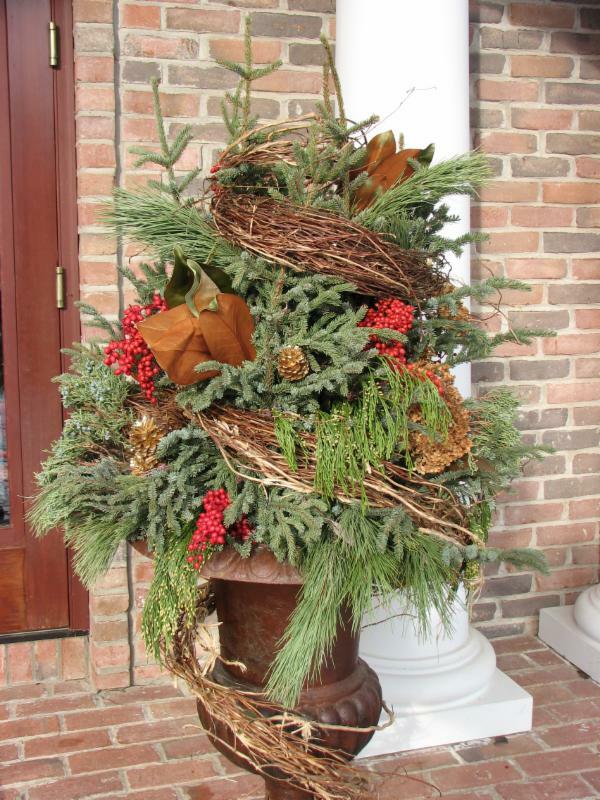 Spruce Tip Containers, Wreaths, Centerpieces, and More! Call or write to reserve your spot: 763-420-2909 , or write: info@GrowHausMN.com. 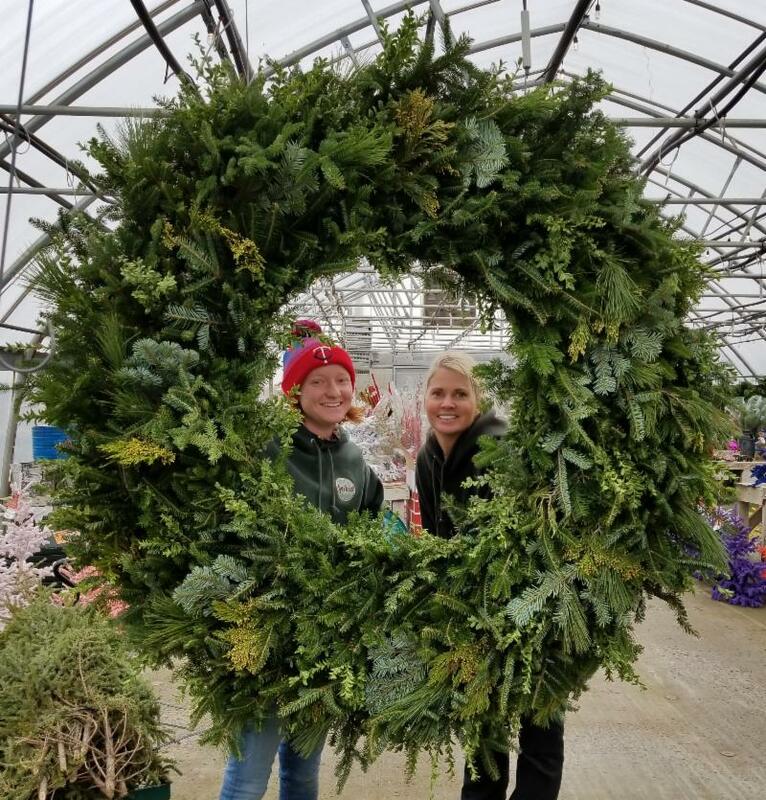 Wreath Make and Take Workshop! Join us in our warm and cozy Winter Wonderland assembly area to create your own wonderful wreath! Our exceptional selection of greens, accents and bows will inspire you to make something truly special, with ease! Make one for a gift, too! Cost of materials only. See more details on all of our Events here .